Thank you for joining us this hour! If you're just joining us, be sure to start at the beginning of our celebration HERE. Gorgeous projects ladies! Thank you so much for sharing them! If you're creating this weekend be sure to tag us at #sctcanada150 or send it to us at ideas@scrapbookandcards.com with "Canada 150" in the reference line. We would LOVE to see your Canada pride to feature throughout the month. Now what about a little SURPRISE we've been hanging on to! Would you like something Canadian themed to create with? 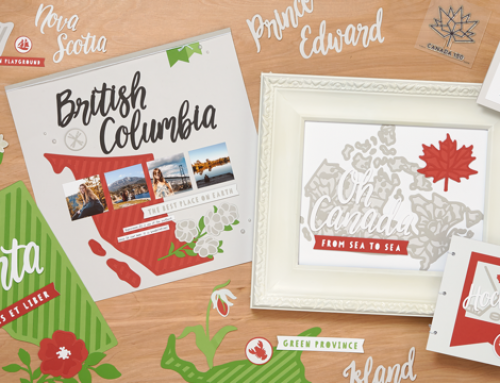 Why not our brand new Celebrate Canada stamp set and matching dies! Designed by design team member Lisa Dickinson, you can preorder the stamp set for only $15 Cdn, the set of dies for $15 Cdn or as a package that includes the stamps and dies for only $25 Cdn! (plus a bit of shipping and any applicable taxes) We expect the stamps and dies to ship the week of July 31st! Click HERE to preorder this limited edition set created just for YOU! If you wish to enter for this hour's prizes, be sure to leave a comment below by July 7th and we will randomly select one lucky winner this hour to win them! After leaving your comment here we hope you'll take a moment to visit us on Facebook and Instagram (@sctmagazine) and leave a comment there as well for THREE chances to win! We'll be compiling all the comments each hour. Next hour is a sweet one! Fun Fact: Canada's official phone number is 1-800-O-CANADA. Woohoo! This is very exciting! A stamp and die set just for Canada! I love it! Yay Canada 150! Everyone is so talented in creating their Canada Cards and Layouts. Thank you everyone who shared. Oh my gosh, I love that stamp and die set! Keeping my fingers and toes crossed for this one!!!!! This is a gorgeous stamp set!!! I love everyone’s creativity! Happy Canada Day!! What a great idea with the stamp and die set and I’m really enjoying reading all the fun facts etc. Hope everyone is having a wonderful Canada Day celebration. We are so fortunate to live in such a great country! Love all the Canada pages and cards. What a great country we have…Happy 150 to the best country in the world. Great stamp and dies set! I already ordered them and can’t wait to get them, even though I live in the U.S. SO excited about this stamp set and dies!!! AMAZING! Thanks to everyone who shared! Thanks for sharing ready inspiration. Would love to win this stamp set and use it to scrap pages of my grandparents. Great layouts and cards everyone! And a great stamp/die set! Thanks SCT! Cool stamp and die set! Would love to win it!! Although I’m not Canadian, I’ve been visiting Canada since I was a little girl, and I’ve loved every minute that I’ve spent there! I’d love to have this stamp and die set to document some of my visits – thanks for the chance to win! Beautiful layouts and awesome die and stamp set. Great inspiration and products to scrap with. Looking forward to the stamp and die set! Love all the layouts and cards! Thanks for sharing the layouts and offering a great prize! Love all the Canadian layouts & cards! Happy 150th Canada! I love the stamps. I love Canada. I am Canadian, and proud. Nice but where’s the Mountie or does the Disney copyright prevent it ? Fabulous projects, love them all! Awesome layouts, cards and projects. LOVE those BIG chairs in Rona’s layout. Great stamp and die!! I would love to win this amazing prize!! Happy 150th Canada!! I would love to use this stamp set to scrap my pics from Crop and Create Abbotsford!! What a great set of LOs and how fun to see a page by someone I know. Dawn’s is so typical of her beautiful work. You folks are really going all out to show off some Canadian pride with some amazing paper crafters. We often forget how large and amazing our country really is. LOVE those cards by Karen Carvell. They shout CANADIAN ?? would be great to add to my collection. scrapbook of my trip to Canada. Very creative work! Canadian pride! The stamp and die set would be a treasure to own! Great layouts! Love the new stamp and die set too :o) Happy Canada Day! These Canada projects are AWESOME!!! Feeling very inspired to do something myself along these lines. Would really love to win a stamp and die set – those are perfect! What amazing creations honoring Canada’s 150th Birthday! Love the stamp and die sets! TFS! What a wonderful stamp and die set to help document this great country! The submissions were fantastic, lots of Canadian pride and striking red & white layouts. Wonderful Canadian themed layouts and cards. Wow! Loving that stamp and die set. Stunning layouts and stamp set is so great. Would definitely like to use it. Off to place my order for the stamps and dies!! Love this set!! 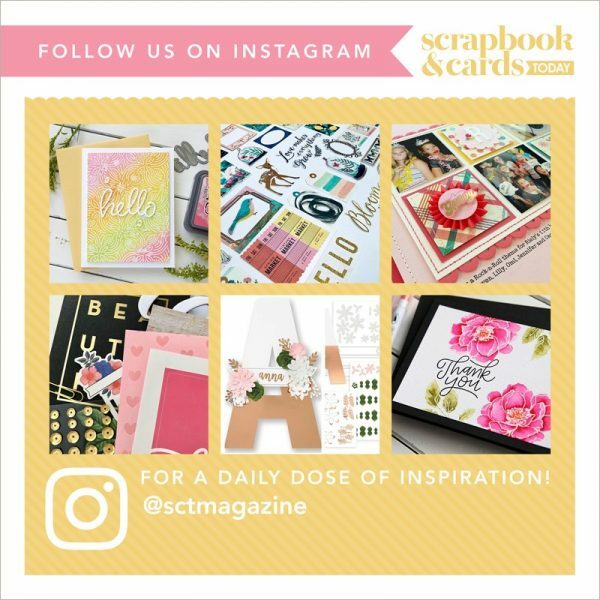 Fabulous layouts and cards…lots of inspiration there. And such a great prize you are offering as well. A great prize package from great Canadian magazine, Scrapbook and Cards Today. Thank you for being so great! Great cards. Talented Canadians. I love this stamp and die set very Canadian and a treasure for all stampers alike. A must have in every Canadian craft room. 1-800-O-CANADA, that’s adorable. I feel like calling it right now and saying Happy Birthday! Thanks for the opportunity to win. Wonderful variety of layouts and cards. Sweet coin for Happy Birthday Canada…. these scrapbook pages remind me of my very simple one that I did when we visited Canada for our agility dog training class. Sweet memories! Love your patriotism, and the spirit captured in the layouts! Very nice pages & cards, Thanks for sharing. Thanks to SCT for the chance to win this set! Great layouts and cards ladies! Those are some awesome Canada Day layouts, so many unique ideas. Inspired by the Canadian layouts! Love the stamp and die set! Very Canadian. Love those Canadian layouts and cards! I love the stamp set and Dies. However when I went to order, noticed that they just had a Canadian price. Will they be available in the U.S.? Great layouts and cards. May have to scraplift a few. Love love this stamp set! Really awesome layouts! Happy Canada Day! Wonderful, wonderful layouts! Think I’ll have to scraplift some, as I continue to work on my Crop and Create trips! I love this – thank you so much! thanks for the chance to win! Love the great layouts! Thanks for sharing some beautiful layouts. Thanks for the chance to win! Just love the Canada stamp and die set. What great layouts and cards! Love them. Very nice layouts indeed. Happy Anniversary!!! Wow those are beautiful layouts! Thanks for the great inspiration and the wonderful giveaway! Love these scrapbook layouts! O Canada indeed! What a great stamp & die set too. Gorgeous layouts displaying the pride of our great country! TFS! Love this stamp set, especially the “Made in Canada” stamp – so many possiblities for this stamp alone, let alone all the other ones! Living the stamp set!! My mind is already thinking ahead to all that could be done with it. Happy Canada Day ?? Need this set for all of our Canada 150 pics! Love the stamp and die set and all the fabulous Canadian work you shared so beautiful!!! Beautiful cards and layouts ladies! Inspired to do one of my own. The amazing stamp set would surely help! Beautiful layouts from a beautiful country. Wowser!! Beautiful layouts and cards — well done!! Drooling over that stamp and die set!! Great Canada Day layouts! Wonderful stamp and die set. So many talented artists…just gorgeous ?? Love the layouts and cards- so inspiring and everyone so talented. Would love to win the Stamp and Die Set. Thanks SCT for making this day even more of a celebration. What great layouts – love being Canadian! Great lyoits and such a cute set of dies and stamps. All of these layouts are just so beautiful and so CANADIAN ??!! Thank you for the inspiration and the stamp and die set is absolutely amazing and would make my layouts and cards just stunning! they are truly wonderful!!! Love this great set! Thank you for considering me! What fun stamps! Our first trip to Canada is next week and I’d love to have these to scrap it with. Such amazing inspiration…love them all! Thanks so much for sharing!!! I’d love to know where the ladies got the cut file for the 150 logo shape? They were all lovely layouts, but those one’s really jumped out at me. Fantastic layouts and cards everyone! Wonderful prize pack too! Love the loonie. What great layout love the different pages. Happy 150th Birthday Canada. Love the stamp and die set!! The layouts that were sent in are great! Awesome work! What a great stamp and die set! I would love to win this fabulous blog candy. It is so hard to find Canadian themed stamping and scrapping supplies. Thanks for the chance to win! What a perfect stamp and die set! I’d love to stamp my cards with ‘made in Canada’! So fun! I love so much this new stamp set!!! Wow!!! The layouts and cards are gorgeous!!! Thank you for sharing them. I love the stamp and die set! Great stamp and die set. Thanks for the fun giveaway. And really enjoyed the beautiful layouts. Congratulations to all the contributors, they are lovely. Love Leanne’s layout – and of course would love to win the stamp and die set as well. Love the stamp set! I have my Canada Day photos on arranged on templates and ready to print and scrap. I have decided that I like hybrid scrapbooking. Happy Canada Day !!! These hourly posts are a super creative way to honour our fabulous country. I love the Celebrate Canada stamp and die set! Thanks for the chance to win! Lovely layouts. I am loving the Canadian red. Beautiful cards and layouts and a beautiful stamp set, as well! Gorgeous pages! May have to lift at least one! Wondering if there is a cut file for the mosaic maple leaf Canada 150 icon? And where I could get it? Love these layouts! Thanks for sharing! OH I loooove the stamp and die set Happy Canada Day?? Love all the awesome pages and cards. The stamp set looks like great fun – love the bear especially. Beautiful inspiration from fellow crafters. Love the stamp set. Awesome layouts and cards! The new Canada stamp set & dies would be very useful this year. Beautiful stamp/die set, truly Canadian. Such beautiful layouts with so much inspiration. Well done everyone. So happy to see a LO by Dawn Brittain. I love everything she does. Awesome inspiration from so many. Great Canadian crafting! Happy Canada Day! Love the layouts and the stamps! Love the stamp and die set…ordered!! Oh wow! The scrapbook layouts and cards look amazing!! Love all the red and white, and the special Canada 150 maple leaf looks really cool in a scrapbook page! Preordered the set. It is pure perfection.